THE BACKSTORY: ABOUT THE ARTIST. Known for his bright, bold, primary colour prints; a fun take on the landscapes and wildlife of the Canadian Rockies, Jason Carter has carved out a reputation as being one of Canada’s freshest, most exciting artists of the moment. The last twelve months has seen Carter’s popularity sky-rocket, seeing him – a natural choice with his penchant for painting moose figures – selected by Banff Lodging Co. to be the local artist that would be featured within each of the Moose Hotel & Suites’ 174 guest rooms. In October 2016, Carter also installed more than 45 original pieces of his distinctive artworks to add pop to the white walls of the new International Terminal at The Calgary International Airport. Most recently, Carter opened his second gallery in Banff, which just held its official opening party. This interview with Carter took place in the Spring of 2016, right when the finishing touches were being made to The Moose Hotel & Suites, which opened shortly after as Banff’s newest hotel – following a full construction from the ground up. When seeking out options for room décor, it was important to Banff Lodging Co. to showcase art pieces from local artists creating interesting work right here in the Canadian Rockies. “As a Banff-based hotel company, we planned for the interiors to reflect the hotel’s immediate location in an authentic way, to be a true signature of Banff,” said Shawn Birch, Director of Projects at Banff Lodging Co.
“Jason Carter’s work not only features scenes from in and around Banff, Lake Louise and the neighbouring Canmore, but is created by an artist with a strong presence right here in the Bow Valley. He’s passionate about this place and takes inspiration from his surroundings. That was important to us. 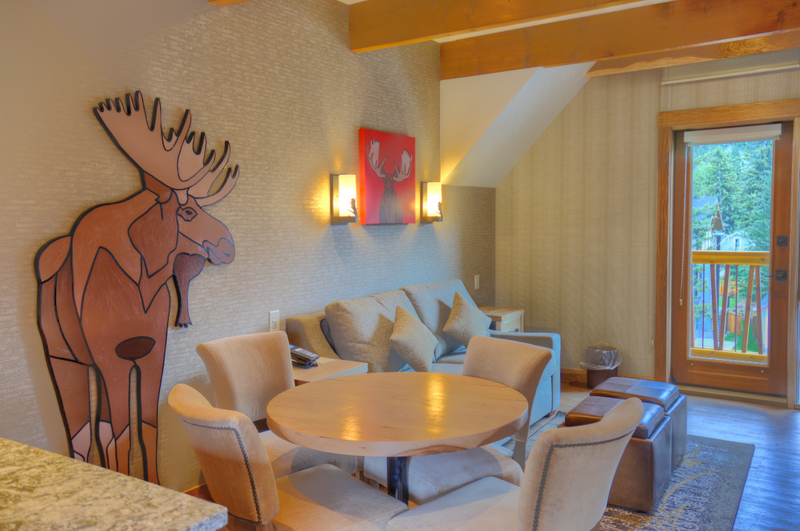 Carter’s work displayed in the guest rooms of the Moose Hotel & Suites ranges from his signature landscapes, to his Moose ‘portraits’ with a cherry red background, as well as an original use of Carter’s work; Moose cut-outs that were each hand-painted by the artist and applied to the wall. Tell us how you became an artist. I became an artist through luck and a great gift. I was given a piece of soapstone for Christmas one year in 2001. I used it as doorstop for 5 years. I was looking to kill some time one afternoon and there it was, just sitting there. And 8 hours later I carved a raven using a wrench and screwdriver, which was really just a rock with a beak and wing on it. BUT, I fell in love with the process of creation and exploring and everything snowballed from there. Is there a difference between doing art and doing art for your career? No, I don’t think there’s a difference between creating art and creating art for your career. If you’re lucky and fortunate enough to be able to create art as a career, that’s great. If you have that passion for something that you love, then you’ll be successful. Did you always know that you wanted to be an artist? No, I’ve always had creative tendencies, and then I worked as a camera operator for 10 years, shot live television which was very creative. But I never knew that I wanted to become a visual artist with regards to becoming a painter and sculptor. 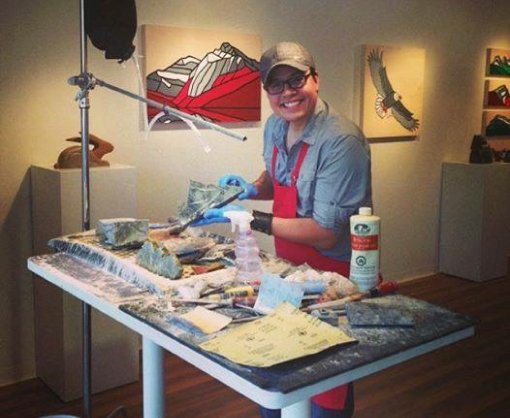 Why did you choose to open a gallery in Canmore? My partner Bridget and I decided to open a gallery in Canmore because we were on a trip to Banff and we heard about this little town outside of Banff called Canmore that had an exploding rabbit population. We wanted to check out this town because we had just released our first children’s book called ‘Who is Boo’, a book all about rabbits. We named our production company Rabbit and the Art Productions, and I carved and painted rabbits. We thought, ‘let’s go check this place out and find all these rabbits’ – I wanted to take photos of the rabbits just for myself. When we got here we fell in love with Canmore, saw an opportunity and jumped at it. Did you have previous connections to the Bow Valley? Yes, I’ve always had a connection with the Bow Valley, in the sense that like all Albertans, and Canadians really, the Rocky Mountains and going camping, and travelling, and skiing and such, was a part of being Canadian for us. Growing up we would come out every year, camp on the May long weekend as I got older, so I’ve always had that connection. Now that I’m a business owner I have even more roots in Canmore. Tell us about your style and how your style was influenced by your life experiences. My style is unique in the sense that it is completely honest. I started sculpting before I was a painter. My very first show was supposed to just be carvings. About 3 months out I realized I wasn’t going to have anything on the walls, being a carving show. So I painted solid coloured pieces as versions of my carvings onto the canvas, just to supplement the carving show. And it went really well. At the end of the day I realized I had stumbled onto something. So I pursued that really simple, blocky design aspect. I had taken graphic design at NAIT, so being a graphic designer before the sculpting and painting, it was a natural progression for me to take those skills and apply those to painting. From there I moved into 3D sculptural work. How is The Moose Hotel project different from other projects you’ve worked on in the past? The Moose Hotel project is very different for me because it’s the very first time I’ve done anything in this scale and quantity; creating 360 giclèe prints, which I printed myself, then sprayed, then had stretched, and completing the actual hand painting of the moose as well. I tracked down someone to cut them out for me, then clear-coated them, primed them, and painted them – all of it was a huge learning curve for me. It was exciting and I’m honoured to be part of the project. How did you get connected to the Moose project? I’m not entirely sure how I got connected to the project. Other than that I know the interior designer, Shannon Feindel, was in the gallery. She’s a fan of the work and she approached me to let me know she was thinking of submitting my work for this project. I didn’t think much of it at the time, wasn’t sure it would go anywhere. Eight months later, Shannon came in and let me know they wanted to meet me and everything moved quickly forward from there. Did you create these art pieces specifically for the Moose Hotel? Yes, I did design the pieces specifically for the Moose, BUT, I took it from existing work and made it work for what we needed. I already had a design of the Moose, but we took that two-dimensional design and figured how can we bring it to life, off the wall, into the space, and that’s where the three-dimensional cut-out of the moose came from. So I definitely looked at the base of my work and then focused into what the Moose needed. Can you tell about the process of hand making and hand painting the tall Moose pieces? Each of the Moose were cut from ¾ inch MDF hardboard. After they’re cut, the edges needed to be routered and smoothed so nobody hurt themselves on the corners. After that they needed to be primed and ready for painting. Once that was done we took the primed pieces, assembled the hardware on the backs and got them ready for hanging in my studio, about 50 at a time. Then we went through and painted, started with one colour, worked our way around, then did the black outlines and the edges, then the clear coat. Was there a specific feeling you wanted to convey through your choices? There wasn’t necessarily a specific feeling, but I think the work already has a positive feeling. I think that’s part of the reason The Moose chose this work to begin with. Between myself, Shannon the designer, and the project people at Banff Caribou Properties [Banff Lodging Co.] we were able to come to a decision as to what direction to go. How did the bold colours reflect your style? Well, bold colours are my style, so it is reflected quite well (laughing). We feel like there is humour in your art, can you comment on that? I think that for me, as a human being, I want to surround myself with positivity and humour, and that directly reflects my work – if I wouldn’t hang it in my space and it’s not something I would look at every day, then I wouldn’t expect anybody else to. I’m a very happy guy so I believe it happened organically and naturally. The artwork definitely reflects my personality. What art pieces for The Moose project are you proudest of and why? I’m proud of all of the pieces, but particularly the 6-foot, standing, cut-out, hand painted Moose. Having original artwork in a hotel room is fantastic and I’m most proud of that. Have you ever seen a Moose? Yes! In my past life I used to shoot live television and we were in Northern BC at a sanctuary. I was lucky enough to go into a pen with six baby Moose. I was standing and holding my camera on my shoulder, with these babies that were the same height as me (I’m 6’3”). They were super cute, awkward, falling all over themselves, licking and sniffing me, one of the best experiences of my life.